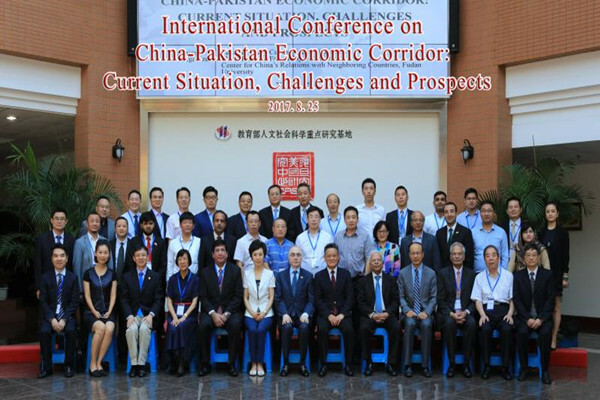 A conference on China-Pakistan Economic Corridor (CPEC) was organized on August 25 by Pakistan Study Center, Fudan University in Shanghai. The Conference discussed various aspects of CPEC, its progress and the way forward. The conference was attended by seasoned diplomats, policy makers, academics and experts from both Pakistan and China. The participants included Ambassador Masood Khalid, Ambassador Sha Zukang, Dr. Ishrat Hussain, Professor Song Zhihui, Professor Sun Hongqi, Professor Tang Mengsheng, Dr. Rifaat Hussain and Consul General Naeem Khan. In the inaugural address of the Conference, Ambassador Masood Khalid highlighted the all weather strategic partnership between Pakistan and China. He stated that friendship with China enjoys across the board support in Pakistan, cross cutting political affiliations or ethnic diversity. He said that the two countries have been close partners for the past six decades and this friendship will gain greater heights in future. He said that Pakistan’s commitment to implement CPEC remains firm and will not be affected by recent political developments. The process of CPEC implementation will be accelerated, Ambassador added. Ambassador Masood Khalid said that Pakistan’s Foreign Policy is focused on promoting peaceful neighbourhood based on the principles of mutual respect, non-interference and equality. As regards terrorism, no country has done more than Pakistan to counter this menace. He stressed that U.S. President Trump’s recent statement ignores the enormous sacrifices given by Pakistani nation. Pakistan has been and will continue to be part of the global counter terrorism efforts and will not allow the use of its territory against any country. He emphasized that the international community needs to work with Pakistan to eradicate terrorism. Ambassador Masood Khalid elucidated that the threat to peace and security cannot be isolated from the complex interplay of regional geopolitics, continued existence of festering disputes like Jammu and Kashmir dispute and hegemonic policies pursued in our region. The Conference participants in their interventions highlighted the importance of CPEC for development of Pakistan, China bilateral economic cooperation, trans-regional linkages and its impact on regional economies. They underscored that President Xi Jinping’s visionary Belt and Road Initiative of which CPEC is a flagship project, will accrue huge dividends for the economic development and prosperity of the people of the region. They viewed its criticism as motivated and self-serving and expressed confidence that the Initiative will have transformative effect on the lives of the people of Pakistan and accelerate the process of socio-economic development of the country.